← Why is the name Upstate University Hospital at Community General? 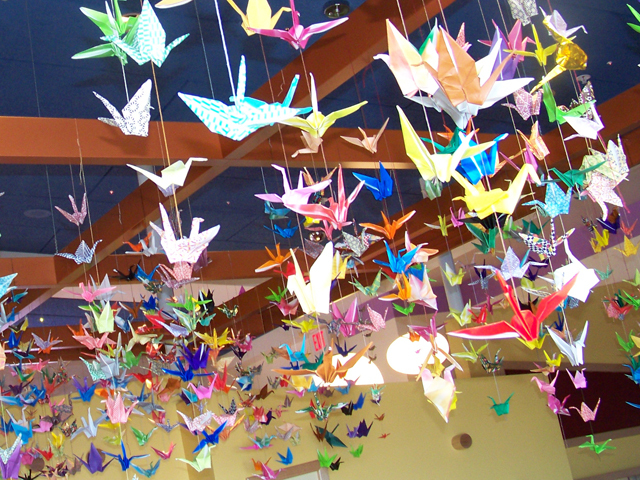 A thousand origami paper cranes on display at Upstate Golisano Children's Hospital. Were you inspired by the display of a thousand origami paper cranes on the 12th floor of the Golisano Children’s Hospital? It’s easy to make your own. Paper cranes can be a quick, low-cost way to enliven a boring space, or a fun rainy-day activity for older children. The cranes at Upstate came from sixth-grade students at St. Mary’s Academy in Baldwinsville and were on display through July. They’ll be stored away and displayed again later. Sixth-graders in Kelly McCann’s class made the cranes after reading the book “One Thousand Paper Cranes: The Story of Sadako and the Children’s Peace Statue.” The book is a true story about Sadako Sasaki, a young Japanese girl who develops leukemia after the atomic bomb was dropped in her hometown of Hiroshima. According to the book, Japanese legend says that if you make a thousand paper cranes, you will be granted a wish. The paper crane has become a symbol of peace and hope. This entry was posted in community, Upstate Golisano Children's Hospital/pediatrics and tagged Golisano hospital, syracuse health care, syracuse hospital, university hospital, upstate medical, upstate university. Bookmark the permalink.